This is my downstairs bath. I have it decorated just the way I want it, with pops of yellow and vintage touches and a shower curtain that goes all the way to the ceiling. The only thing is that a few months ago I threw out the wine cork bathmat (this is an old picture). It was falling apart under the increased wear and tear since Jack started taking regular baths in here and the floor has been bare ever since. I was thinking about DIYing a new bathmat–specifically I was going to crochet a giant doily–but the more I thought about it it just didn’t seem very practical. I mean, it would be adorable for sure, but I wasn’t sure it would be comfortable or absorbent or machine washable. These are requirements for a bathroom used by tiny humans. So I’ve been looking around and I’m strongly considering this round rug from World Market. 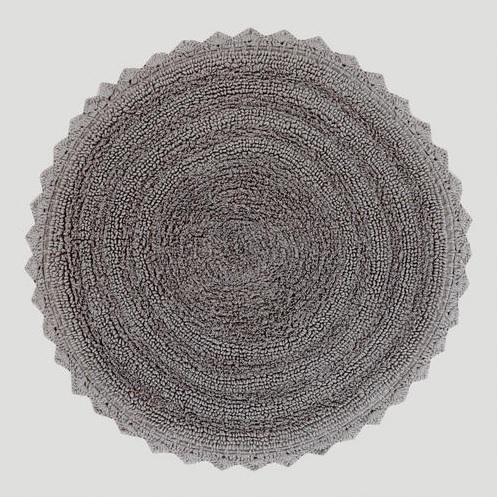 I think the dark gray would look really good and the reviews are great (I actually first fell in love with this rug from but the reviews indicated it wasn’t very well made so the search continued). Another thing we could really use in this bathroom is a mat inside the tub. Jack is now pulling up and standing and the slippery tub makes me nervous. This whale mat is really fun and cute. I think I need it. 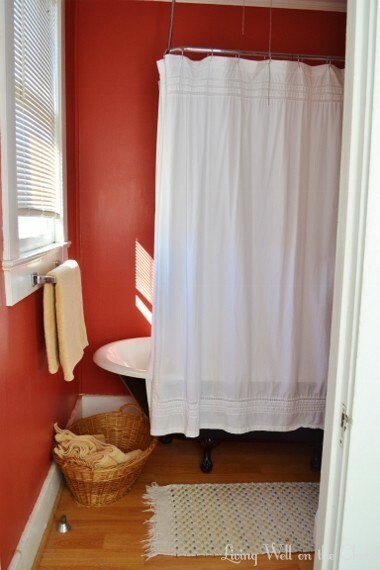 Our upstairs bath has a lot of challenges–it’s tiny and painted my least favorite color, for starters–but one thing I’ll never complain about is the tub. Despite my love for a good clawfoot, one challenge anyone who’s lived with one will understand is the shampoo situation. There’s no place to our your stuff! 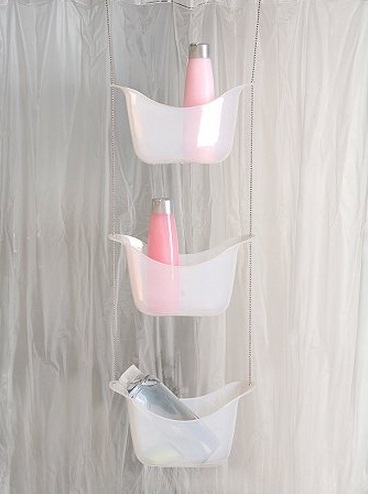 We’ve always used one of those wire caddies that hangs over the shower head, but it’s not really an ideal solution and bottles are constantly falling out. I was so excited when I spotted this shower storage system that seems to have been made for old tubs! I added it to my “wish list” board on Pinterest so I can remember it next time someone asks me what I’d like for a gift. 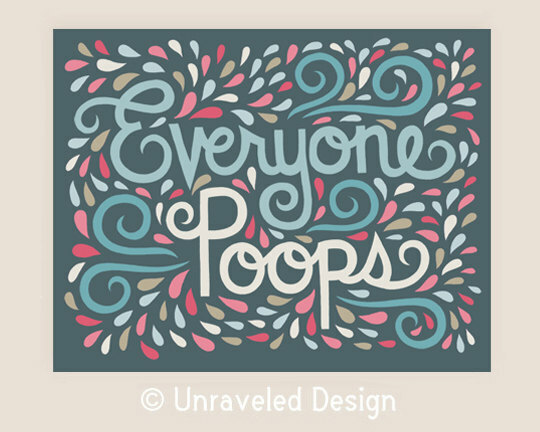 And just because it cracks me up, I’d love to frame this print in here if we ever get around to painting over the red. Even Nick laughed when I showed it to him, and he usually is not amused by home decor. So that’s what I’d buy if I had $85 to go spending on bath accessories right now, plus time and inclination to paint the upstairs. You’d think with it being such a small room I’d be able to knock it out quickly, but I’m intimidated by the red and all the nooks and crannies.